Planning is now well under way for our first Church House Ale which, this year, will be on 29th May, which is both 'Oak Apple Day' and the Spring Bank Holiday Monday. It has been decided to leave some events - Tug of War & Archery - to another year, when a suitable site (field) can be organised. There will be two distinct parts to the days festivities, a Family Fun afternoon from 2pm to around (Devon time) 6.30pm and then an adult Feasting & Ale evening with food starting at 7.30pm. The evening is a time for the adults to relax to the music of our harpist, while you have your simple medieval feast - a sort of stew with potatoes and meat or a vegetarian version and sample our Church House Ale, specially brewed for us by Exe Valley Brewery. After a flagon or two, you may feel inclined to get up and dance to our fiddler and callers. There again you may just like to have another flagon and just watch. While the afternoon is free, the meal is £3.50 per head. Tickets are available in advance at the South Zeal and Sticklepath Stores or you can take a chance and pay on the night. If we are honest, we don't know exactly what the event will be like. We know what is planned but, being the first time in nearly 500 years that it has happened, we don't know who or how many will come, what the weather will be, and so on. We would like the event to grow each year (at Whitsun - the traditional time) and to become, in time, as recognised as Widecome Fair. 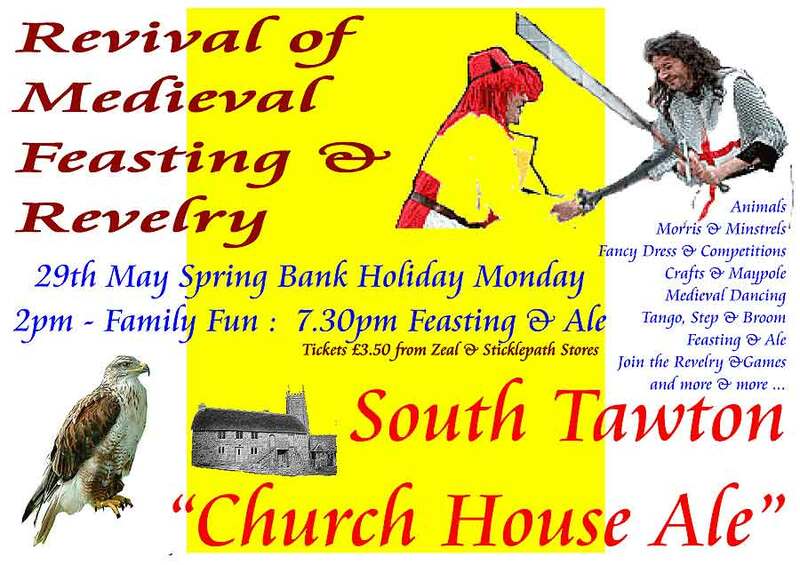 Ales in the 15th century were great big parties for the whole community - a fun way of raising money for community life. Our Ale is intended to be a whole community party as a fun way to raise money to conserve our newly restored Heritage Site for future generations. On the practical side, the event will take place in Church House, in St Andrew's churchyard and in the village square. Through traffic will be requested to take the alternative route round the square and visitors cars will park (free) in a field a hundred yards from the square. Let us hope the weather is kind and everyone has a wonderful time. We have now come through the 'honeymoon' period of the Restoration, funded by the Heritage Lottery Fund and other donors, and now are having to face the fact that we need to raise sizable amounts of cash both to keep the building in the splendid condition that its in (repairs, re-thatching, heating, insurance, cleaning, etc.) but also to improve the Heritage Site visitor and educational facilities and to consolidate this listed Grade 2* building with the Grade 1 church of St Andrew next door. We are raising money by lettings, events such as the Church House Ale above and sales and donations from the public on our Open Days Wednesdays and Sundays. This is all being achieved by a hard working band of volunteers including your Committee. However, we need a solid base to work from and this is being provided by "The Friends of Church House" group which was formed to provide the initial cash, which got the whole restoration started. This, at present, is a small group of only about 50 dedicated people. We need to increase that, at least 5 fold to ensure our bills will be covered. The group has now been extended to include "Far Friends", people abroad or elsewhere in this country who cannot regularly attend (if at all) but still care for their heritage.